Christmas season has come, and so do the corny and cheesy Tagalog Christmas Pick Up and Banat Lines. 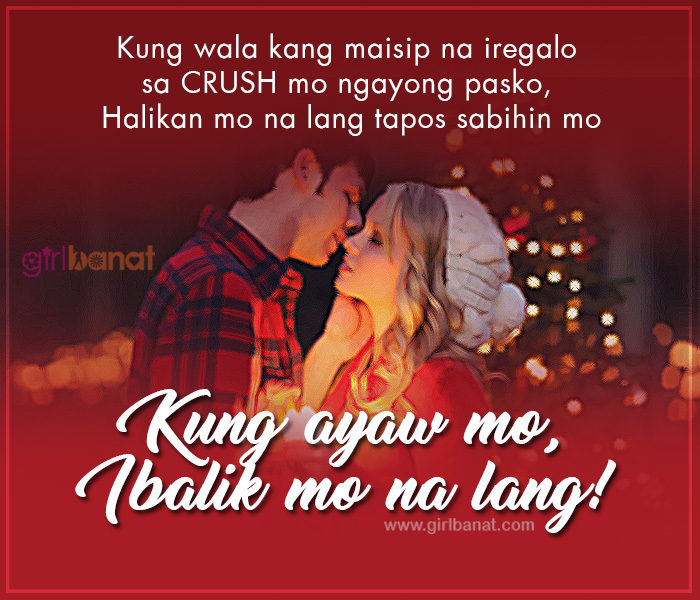 Send these Tagalog Christmas Pick Up and Banat Lines to your crush, girlfriend/ boyfriend or to your special someone and let them know how you feel about them. Even if it is Christmas, you can enjoy the “kilig” moment you have experienced during Valentines day. Letting someone know how special they are by sending these pick up lines will make you brigthen your day. Make other’s smile and feel special even if it is just a text message or chat message. So what are you waiting for? Check these out now! Tagalog Love Quotes and Messages is a selection of love quotes where your emotions can be reflected and could help you express your long kept feelings. Whenever you hear or read some love quotes, it’s either you remember someone or it will strike you right through the bone. But love quotes somehow can help you suppress the feeling you’ve been keeping deep within your heart. If you’re in love and being loved in return, keep the spark. If it’s over for the two of you then move on. Always remember that love comes to those who still hope even though they’ve been disappointed, to those who still believe even though they’ve been betrayed, to those who still love even though they’ve been hurt before.